Yamaha Motor Mobility "05GEN" and "06GEN", Connecting People and Places　— "Refined Dynamism" Design Philosophy for New Generation Concept Models 5 & 6 — - News Releases | Yamaha Motor Co., Ltd.
IWATA, June 23, 2016—Yamaha Motor Co., Ltd. (Tokyo: 7272) announced today the development of new generation design concept models 05GEN and 06GEN, based on the design philosophy Refined Dynamism. Intentionally taking a completely different approach to the conventional core function of mobility vehicles to date (the need for effective travel incorporating speed and distance), both of these models have been designed to move in a more leisurely fashion over short distances. In doing so, these models assist in forming connections between people and places, either when at home or away, as well as between people and people. These endeavors are part of the "island development" program of architect Toyo Ito in Omishima (Imabari City, Ehime Prefecture) joining Yamaha Motor. 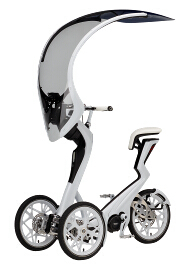 05GEN is a three-wheel mobility vehicle fitted with electric assist technology designed to give the impression of a garment lightly draped around the rider’s body. With a compact body and a roof design that provides a feeling of openness, this vehicle offers protection from light rain and the sun during short excursions while also allowing interaction with the people around you. 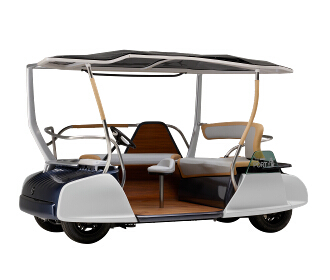 06GEN is an electric four-wheel mobility vehicle designed to evoke indeterminate spaces, which are neither truly indoors nor outdoors, such as the Japanese-style “Engawa” veranda. With its open design and soft curvature suited to a more relaxed traveling style, the 06GEN provides a friendly environment, both warm and inviting to passengers while on board. The 05GEN and 06GEN will be on display at the renewal opening event (July 2nd) and Talk Event (July 3rd) of the Imabari Toyo Ito Museum of Architecture in Omishima, with the 05GEN to be displayed at the museum afterwards.